Description: Each magnet measures 1.5 inches. Available individually or as a set of 4. Perfect for hanging notes or decorating with a little sorority glam. 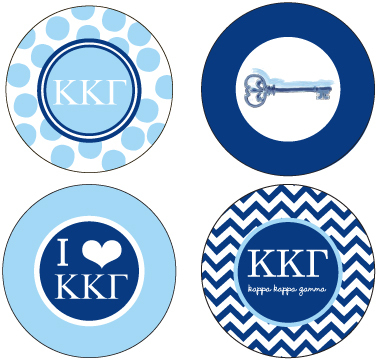 Perfect for your sorority girl, whether she is in college now or a proud alumni. Available sororities for this product: Alpha Chi Omega, Alpha Delta Pi, Alpha Gamma Delta, Alpha Omicron Pi, Alpha Phi, Alpha Sigma Alpha, Alpha Sigma, Tau, Alpha Xi Delta, Chi Omega, Delta Delta Delta, Delta Gamma, Delta Phi Epsilon, Delta Zeta, Gamma Phi Beta, Kappa Alpha Theta, Kappa Delta, Kappa Kappa Gamma, Phi Mu, Pi Beta Phi, Sigma Kappa, Sigma Sigma Sigma, Theta Phi Alpha, Zeta Tau Alpha.